One doesn’t usually expect to find a work of art taking pride of place in the bathroom, but this is precisely what the new octagon washbasin by Villeroy & Boch is. Pushing the boundaries of innovation, the washbasin takes bathroom design into an entirely new dimension. It makes time spent in the bathroom an experience of cleansing the mind as well as the body – refreshing jaded senses and renewing tired minds. The spectacular octagonal washbasin demonstrates a completely fresh approach to the bathroom’s mundane traditional function. By transforming the practical to the sublime, it shows that the modern bathroom is no longer merely a place of purpose, but also a place of enjoyment. 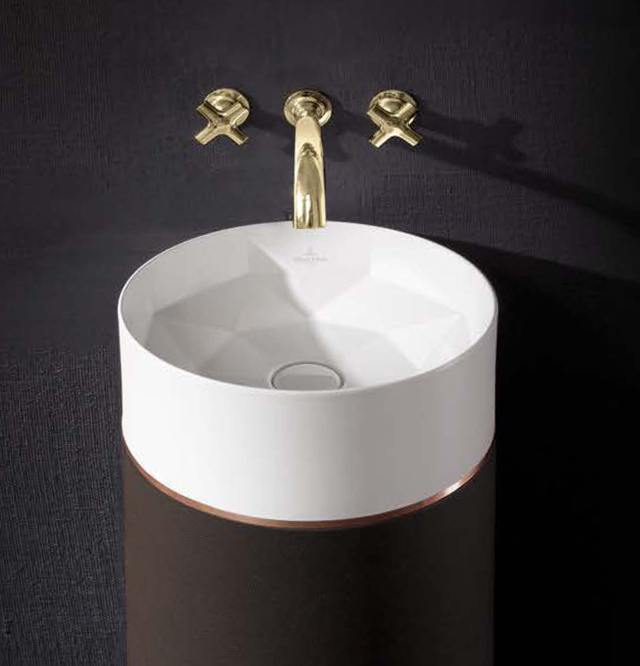 A masterpiece of precision, both technologically and artistically speaking, the washbasin uses Villeroy & Boch’s state-of-the-art TitanCeram, a new ceramic material designed with hygiene and beauty in mind. 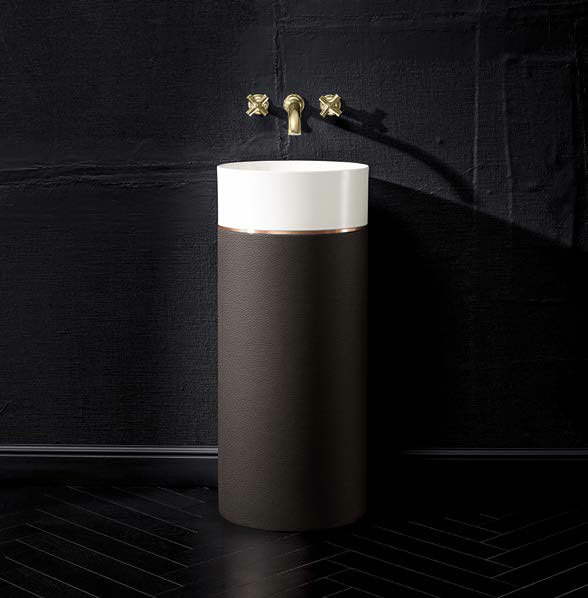 The octagon washbasin has a free-standing pedestal, and is offered in three different finishes to complement any high-quality bathroom design. The natural textures of mocha leather, dark chestnut and smoky slate lend nature’s own exquisite forms to the finish of the pedestal. Encircled with a copper ring between the finish and the basin, the unit is a unique expression of all that nature intended – freshness, cleanliness and beauty. To complete the picture of stylish elegance, the octagonal washbasin can be teamed with Villeroy & Boch Champagne tap fittings. 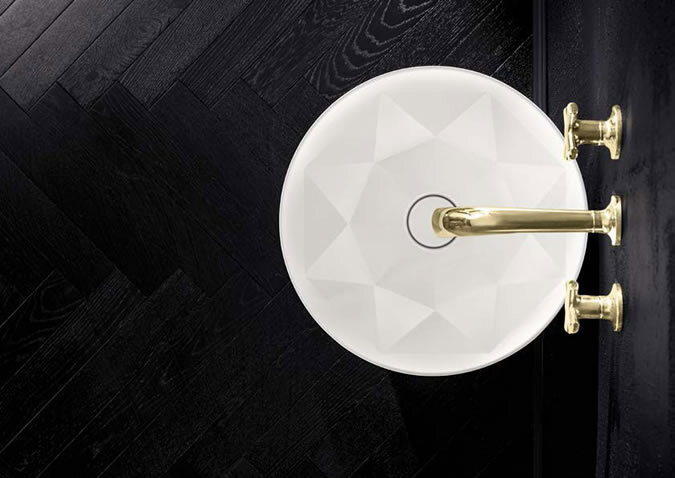 Individual and innovative, the octagonal shape of the basin reflects a beauty and precision not usually associated with health and wellness, resulting in elevating it to a whole new level. This entry was posted in Luxury Bathrooms, New Products, Villeroy & Boch and tagged Leather Vanity Unit, octagonal washbasin, Titan Ceram, Villeroy & Boch. Bookmark the permalink.